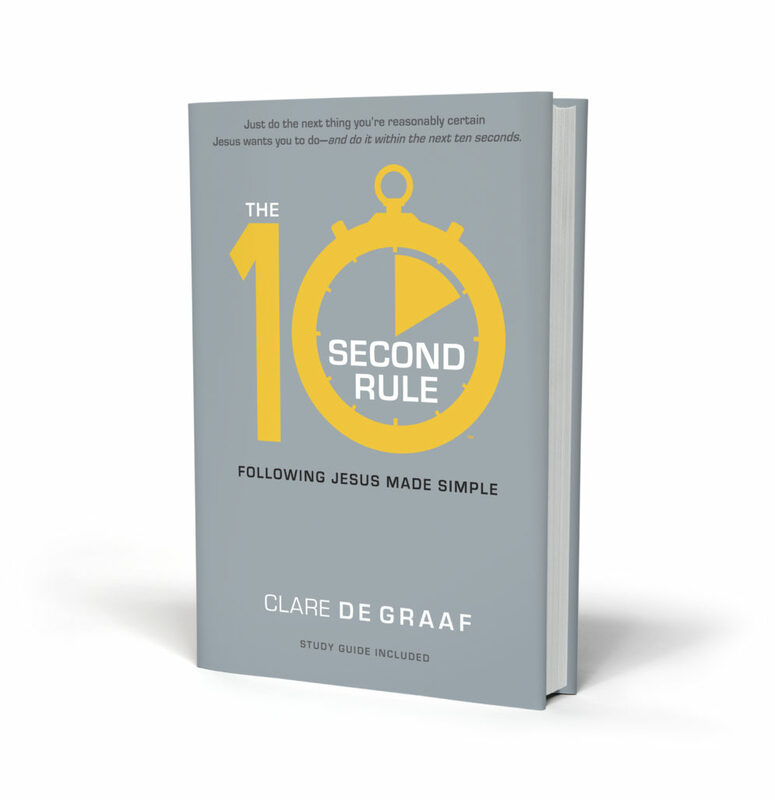 The 10-Second Rule will encourage you to do the next thing you’re reasonably certain Jesus wants you to do (and do it within the next ten seconds before you change your mind!). If you want to break out of this spiritual gerbil cage and begin living the adventure Jesus intends for you just follow the Rule! Summary: Author Clare De Graaf lays out the differences between being a lukewarm cultural Christian, and a passionate follower of Jesus. He exhorts readers to choose a life of radical obedience to whatever Jesus asks, by using the “10 Second Rule”. After exploration and experience of his own, De Graaf is convinced that this is the life Jesus intended for us, and that it leads to more fulfillments in your spiritual life than you could ever hope for. Summary: De Graaf goes deeper into what obedience looks like day to day, and reminds Christians of the “dueling voices” in their heads calling for obedience and the other for self-preservation and protection. He calls Christians out on living lives of “partial surrender” and claiming grace covers them for the rest as a sort of cop-out on living fully surrendered. The key to this sinful habit of disobedience is to live minute-by-minute, willing to obey the next thing Jesus asks you to do, and to NOT overthink the consequences. Summary: In this Chapter, De Graaf outlines what it means to listen to the voice of God and respond in obedience. He talks about how to discern if it the “will of God”, but also encourages readers to not focus so much on knowing exactly what God wants, and instead being willing to just act and trust that God will make the most of it. Summary: This chapter talks about how the little things in life that we view as pointless are all for a greater good. God has us do all of these little things that all will lead to something great. We may not see the end result in our life, but what we do in our life can plant seeds for greater things in the future even though we don’t always understand why we do a lot of the things we do. It’s these little acts of obedience in life that help shape who we become as Christians. Summary: This chapter has much to do with having faith in God and being willing to test our faith. When we feel that God is calling us to do something, we need to do it instantly or else we’ll come up with many excuses of why we can’t do what he is telling us to do. One of the main reasons we don’t do these things is because of what others will think. Many things we do in this life will go unnoticed and what we do is more when nobody is watching is much more important than what we do when others are looking. Summary: This chapter deals with us preparing ourselves for quizzes and situations that God uses in our life to test how obedient we are and learning from our past experiences in order to prepare ourselves for these future quizzes. What we learn from these experiences can become what we use for our pre-decisions to better handle situations that we feel called to. The second part deals with that in order to change the lives of others we need to eliminate the waste in our life before we can help others. Summary: This chapter brings to light the hard parts of serving God. There will be difficult people in our lives that we are called to serve that we do not always like. These are the times when we need to remember that Jesus found forgiveness for people who were rejected by society. We need to remember that we need to love everyone, even if they’re people that we are not fond of. We need to see these opportunities as chances to learn and grow in our faith.